Spotting a leak sometimes can be quite difficult. But technology allows us to see through walls without opening them up to find potential problems. 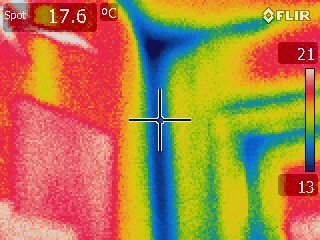 This is a thermal imaging shot showing a leak in the roof which was damaging the interior drywall. The previous owners prior to selling their home, covered up the issue with new paint. An inspection performed by our company spotted the leak and saved the new home thousands of dollars which was credited to them prior to the sale.